In the Times Literary Supplement (TLS) of 2 September, Gregory Currie wrote an article entitled "Let's pretend" in which he argues that serious fiction affords no insight into the human condition and doesn't enable us to learn about ourselves. Currie's first reason for doubting the value of literature is that it draws on people's ordinary understandings, known as "folk psychology," in which we think we know why we act as we do. But, says Currie, in the psychology laboratory there have been many demonstrations that we don't always know why we act, and that motives can differ from any that folk psychology would suggest. One of his examples is that, "if you hold a hot cup of coffee; you will probably judge them [other people about whom you are thinking] to have 'warmer' personalities" (p. 14). Currie is right. Experimentation of this kind has shown that we don't necessarily have introspective access to why we act or speak in a particular way, and also that we are not always good at imagining emotional effects in the future. 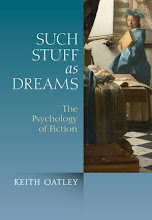 Currie concludes that if you want to understand why people act as they do you shouldn't rely on folk psychology or imagination, as you must if you read fiction. You should read Nature Neuroscience rather than Middlemarch. to the extent that creative writers are subject to the emotional distortions we associate with bipolar disorder, we can expect that they, on balance, will be more prone than the rest of us to misjudge the emotional impact of imagined scenarios (p. 15). Currie implies that we can't expect to learn anything useful from people who are as crazy as many writers seem to be. Should one accept these arguments? Folk psychology is the ordinary-language way in which we think about and communicate our intentions, beliefs, and emotions, to others. 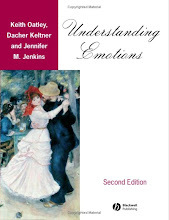 Yes, fiction is based in folk psychology, and psychological researchers have shown, in certain restricted situations, that folk psychological understandings can be wrong. But psychologists also know that when we say we will do something, for instance write a piece on the psychology of fiction, we are telling someone of an intention that we can then carry out. If our folk-psychology had no relation to our actual goals and plans of action, Greg Currie could not have arranged to write an article for the TLS, and I wouldn't know why I wrote this reply. As to Currie's proposal that writers of fiction have higher-than-normal levels of psychopathology, he makes no comparison with levels in the ordinary community. The best recent study of psychiatric conditions in the community, based on DSM diagnoses, is by Terrie Moffitt et al. (2010), who found that the proportion of people who had suffered an anxiety disorder during their lives was 49.5%, the proportion who had suffered from depression was 41.4%, and the proportion who had experienced alcohol dependence was 31.8% (a substantial number of people had more than one disorder). So it's not clear how different the fiction writers in Post's study were in their rates of disorder from members of the ordinary population. 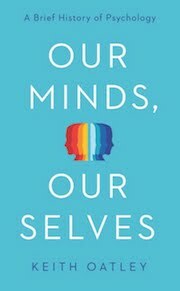 I would suggest that the lesson of research on the mental disorders of creative writers isn't that anything that emotionally disordered writers write is wrong, but that fiction writers who suffer from disorders can sometimes invite us to reflect on circumstances that we may suffer ourselves, or on circumstances we haven't encountered, which we may usefully imagine ourselves into. Most mental disorders (anxiety and depression being the most common) don't start because something has gone wrong in people's brains. They start because something has gone wrong in people's lives. Currie ends his piece with "a suggestion about how to read the literary canon." He suggests we should read it as pretense, not real, and says: "when we engage with great literature we do not come away with more knowledge, clarified emotions, or deeper human sympathies" (p. 15). I disagree. Fiction writers such as Marcel Proust (diagnosed by Post as having severe psychopathology) and Henry James (diagnosed by Post as having marked psychopathology) whom Currie offers as examples of canonical authors, don't say: "here is what you should believe about the emotional impact of this situation." They say: "Here's a situation. Imagine yourself into it. How do you feel about this?" Fictional literature isn't empirical description of human behaviour, as Currie assumes. It is simulation of selves in the social world (click here). As evidence that fiction-as-simulation is reliable and valid about understanding interactions with others, I would cite our laboratory findings (e.g. Mar et al. 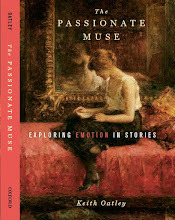 2006; 2009) that reading fiction is associated not with worse understandings—as Currie would predict—but with better understandings of others (click here). Currie, G. (2011). Let's pretend: Literature and the psychology lab. Times Literary Supplement, September 2, pp. 14-15. Mar, R. A., Oatley, K., & Peterson, J. B. (2009). Exploring the link between reading fiction and empathy: Ruling out individual differences and examining outcomes. Communications: The European Journal of Communication, 34, 407-428. Moffitt, T. E., Caspi, A., Taylor, A., Kokaua, J., Milne, B. J., Polanczyk, G., et al. (2010). How common are common mental disorders? Evidence that lifetime prevalence rates are doubled by prospective versus retrospective ascertainment. Psychological Medicine, 40, 899-909. Post, F. (1994). Creativity and psychopathology: A study of 291 famous men. British Journal of Psychiatry, 165, 22-34. I always remember the Asimov story about the robot who could create art, something outwith the parameters its normal programming, because it was, well, broken. The company were willing to fix it but its owner declined the offer. Asimov isn’t generally regarded as much more than a storyteller – that’s certainly how he regarded himself – and yet the metaphor here is a striking and powerful one. I have always felt that I was broken and that my creativity sprang from the specific way in which I was broken but I have never felt the need to get ‘fixed’. What Currie is also discounting is the fact that it is the reader who completes a book; it is a collaborative enterprise and so what if the writer is limited in some way. Thanks very much, Jim, for this comment. Your Asimov example seems exactly right to me. What one explores in fiction is, I think, George Eliot's idea of being able to go beyond the confines of one's personal lot, and that includes not being just normal. And I agree: Currie doesn't seem to engage with the idea that it's the reader who completes the book, that is to say, brings it alive. I used to think that author and reader each contribute 50%, but I now wonder whether the ratio might be something more like: author 30%, reader 70%. I would imagine the Pareto principle applies. Well, I'm an author of fiction and I get too many emails from readers that contradict Currie's thesis. Then again, there's a great deal wrong with a survey that focuses on the literary canon, which tends to exclude non-male, non-white writers and most other fiction. The notion that readers passively accept the fictive world is just nonsense. Yes, thank you Jim. I imagine you mean the Pareto principle (that in an organization 20 percent of the people make pretty-much all the difference) is to be applied to author and reader: that the 30 percent which is supplied by the author makes pretty-much all the difference to the reader. What a nice idea! Thank you Carolyn. I rather agree with you. Readers do appreciate what writers have written, not because they have been led into error, but because they have attained insights that they might not otherwise have had. As you say, the reader is not passive. I think the active participation of readers is an aspect that's been very interesting in recent discussions of what happens in fiction. I totally disagree with Currie as well, yet like to cite Koestler who spoke of pathology and creativity as being two sides of a coin from the same evolutionary mint. It may well be that hypersensitivity to the environment with high emotional acuity is what produces such profound insight into the human condition. I also believe that the ability to produce beautiful, metaphoric language is an attribute of increased right-hemispheric dominance for language, resulting from genetic predisposition, early childhood or later traumas. 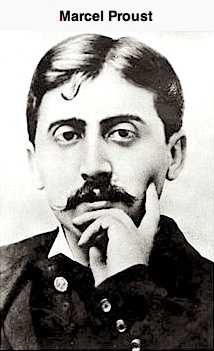 Proust himself was born ill from the uterine environment of his mother's suffering from hunger in wartime France and was always highly dependent on her. In photos, he also appears to be left-handed. It may be fair in the end to say that what we consider as pathology is a normal reaction to the vicissitudes of living. Thank you, Carole, for this comment. I think you are right. Although some kinds of mental illness, notably psychoses like schizophrenia, do involve distortions of reality (at least on occasions) most emotional disorders are, as you put it, reactions to the vicissitudes of living, reactions that are not irrational but which can become perplexing. I think it is not at all unlikely that a good deal of great art comes from trying to make sense of such perplexities. I agree, too, that metaphor and evocative language are also important in literature, most of all, perhaps, in that they can enable us to think more deeply about others and our selves. Interestingly, I'm currently writing a chapter on James Merrill, who wrote his thesis at Amherst on Proust. Merrill's Changing Light at Sandover is all about "making sense" in phenomenally beautiful poetry expressing his odyssey with the "voices" (or other selves) of his Ouija board contacts. Mark Bauer, in This Composite Voice, cites Merrill as saying: "What if somebody had not told me to read Proust? The act of sitting there reading; I mean it was is if my mind was being permanently changed and tampered with." Literature has a major influence on us, no matter what our mental persuasions. I think we all are looking for some kind of confirmation, a "making sense" of our own reality. The author's power of expression feeds this impact on our emotional selves. Yes, once again thanks, Carole. What you write is interesting. I, too, have enjoyed Proust getting into my mind, but this doesn't, to me, feel like tampering; more like extending. I think as a writer one spends a long time on a particular issue, sometimes on a particular paragraph, sometimes just on a particular sentence. Certainly Proust went over and over what he was writing, so that the words he came up with are likely to be better than his or anyone's first, off-the-cuff thoughts, and this in itself seems to me valuable. I've been asking myself how the study of writers' mental illnesses actually works: can you really judge the psychological constitution of a writer who has been dead for at least decades (if not longer)? Furthermore, one should take into account that writers who lived around 1900 fulfilled certain stereotypes (the Dandy writer, like Baudelaire). So their being eccentric, or deviant, or simply crazy was to a great deal part of their habitus. But habitus shouldn't be confused with illness, I'd assume... Not to speak of the fatal historical link between "genius" and "madness", which has been (and still might be) so powerful. Unfortunately, Currie's article reinforces this view. I was so glad to finally find your post. Thanks, and greetings from Germany.